With increasing concern for the environment, and the introduction of new planning regulations, many people now opt for a waste water treatment plant rather than a septic tank system. Treatment plants take the basic scientific principles of septic tank systems, but accelerate these to produce a much cleaner and safer effluent, and soak away problems are greatly reduced; but septic tank systems are simpler and can still provide an effective and economical solution. Unlike cesspits, septic tanks are designed to allow liquors to flow through the tank and enter the surrounding land or water course via a soak-a-way without causing damage to the environment. Waste waters enter the tank and the flow is reduced through a series of baffles allowing the solids to sink to the bottom. Additionally, smaller particles float to the surface creating a scum. By holding the water in the system, suspended solids are removed and much of the sludge decomposes through natural aerobic and anaerobic processes. 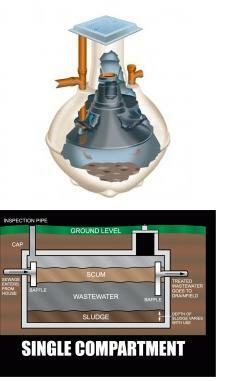 In turn the semi-treated liquor is allowed to exit the tank and leach to nearby land via a soak-a-way system.